Pew Research Center did an analysis of the coverage of President Trump in the first 60 days compared to the previous presidents. 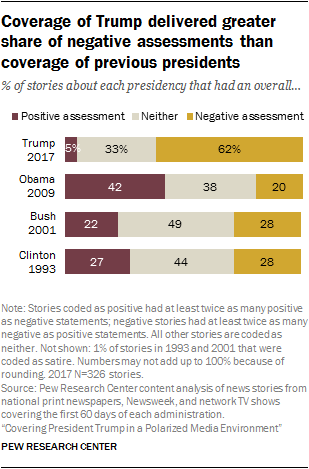 They found only 5% of the stories on President Trump were positive compared to 62% negative. Comparing that to the first 60 days of President Obama and you see a very disturbing difference. 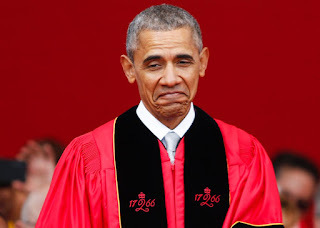 Only 20% of the stories were negative in his first 60 days in office and 42% positive. 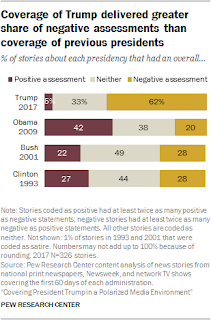 President Trump has had three times more negative stories on him than President Obama did and an eighth of the positive news stories that greeted the previous administration. Harvard University's Shorenstein Center on Media, Politics and Public Safety did their own research of the first 60 days of President Trump and found CNN and NBC ran 93% negative media coverage to only 7% positive. The blend wasn't much better at CBS with 91% negative coverage and only 9% positive. So how did Fox News fare in their coverage? They ran 52% negative coverage to 48% positive which would be pretty close to fair and balanced. Those are the numbers in black and white. Being a professional journalist requires you to keep the news comprehensive and proportional. It requires you to be fair and balanced and be as impartial as possible in covering the news of the day. It is always difficult to be completely unbiased given that journalists are human beings. There is without a doubt a certain slant to most news coverage even on a good day. As you look at the numbers though from the first 60 days of each of the last four presidents it becomes quite clear that the press has become overwhelmeingly derelict in their duties. The definition of dereliction of duty is the shameful failure to fulfill one's obligations. It is an intentional or conscious neglect. It is hard to argue that the press is not guilty of dereliction of duty. 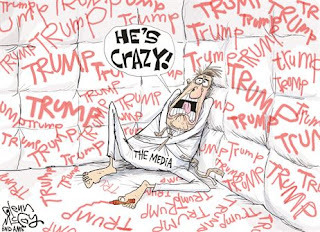 So when Jim Acosta says the press is not the enemy he fails to see outside of his bubble in which he and his comrades live. He is just ignorant at best or disingenuous at worst. 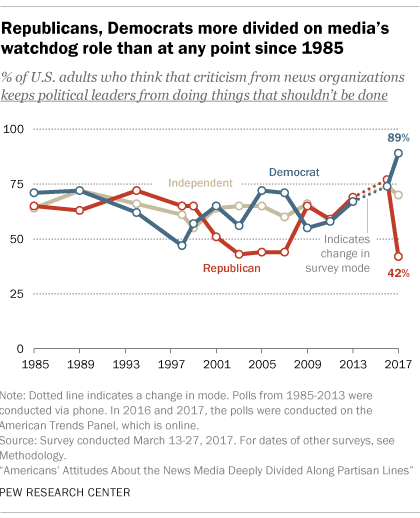 Republicans and Democrats are more divided on the media's watchdog role than at any point in the last thirty years. The media has only themselves to blame. 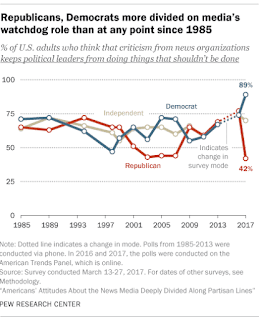 The reality check here is that liberals, who primarily fill the media newsrooms and newspaper industry, are clouded by their deeply personal progressive ideology and fail to see how those people outside of Washington, New York, and Los Angeles view their news coverage. 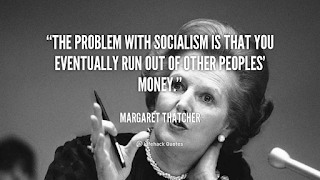 With Mrs. Clinton losing the election the progressive crowd has become deeply unhinged and have externalized their anger and lashed out instead of taking a step back and reflecting on why and how they lost the election to President Trump. 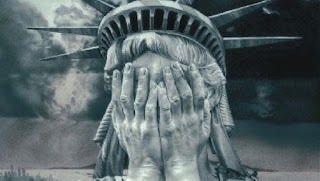 That deep seething hatred for not only President Trump, but for the common man who lives outside the coastal areas of America, comes across loud and clear in the daily press clips and media coverage. It is palpable. Perception is reality. When that perception is backed up by empirical evidence it just solidifies that perception in people's minds. In a perfect world, if journalists were truly fulfilling their duties, the press would be trusted as a watchdog on politicians and government overreach. They wouldn't be viewed by most as an enemy but rather a valuable partner with we the people in maintaining liberty and freedom in our republic. But we aren't living in a perfect world. 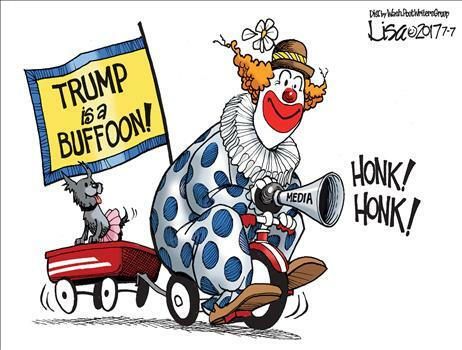 When the media roots from the press box and clearly cheers for certain personalities and actively cheers against others it is not good for journalism and not good for America.